A Tent City protest has been set up to protest the high price of housing (which is high). Tel Aviv Mayor Ron Huldai was repeatedly interrupted as he addressed the crowd on the first night of the protest, and left after a protester poured beer on him. Deputy Mayor Assaf Zamir, who represents a young people's party on the city council and who had helped the protesters obtain their permit, left after someone threw an egg at him. Opposition MKs Nitzan Horowitz (Meretz) and Dov Khenin (Hadash ) were welcomed more warmly. I can only ask some obvious questions. Where are the police? Why aren't they protecting these public officials from violence? Where is the outcry from the media against this violence against elected officials? Where is the prosecutors office, and why hasn't an investigation begun? These aren't just words, these are acts of violence. But most importantly, why isn't everyone demanding an end to the effective freeze that still affects Jerusalem and Judea/Samaria which would almost immediately work to lower high housing prices? But no, instead just silence. Today is Friday. That means that the Left will be practicing their freedom of speech and their freedom to obstruct the freedom of movement of others by protesting in different neighborhoods against Jews . One such neighborhood is Ma'aleh HaZeitim, aka Ras El Amud. In Ras El Amud, homes have been built on (legally purchased) Jewish owned land and that seems to upset the left who don't believe in equal property rights for Jews. In recent history, one of the first land purchase in Ras El Amud was in the very early 1900's by Nissan Bak and Moshe Wittenburg who bought various plots. But Jewish history in Ras El Amud goes even further back then a mere century. Archaeologists have uncovered a jar handle, dated to the First Temple, with the name "Menachem" inscribed on the handle (Menachem, not Menachem Mendel btw). Pretty cool, but these protests against Jews happen every Friday, so why bring it up now? One word. Glenn Beck. (OK that's two). You don't get Glenn Beck TV on cable? Me either (I actually don't have a TV, which makes that all the more difficult). Glenn Beck was in Israel this past week meeting and speaking with different people (except Moshe Feiglin). I was forwarded this link of Glenn Beck listening to one of Israel's local defenders telling him all about Jewish rights in Israel. It's an interesting story. And as it happens, the meeting was in Ras El Amud. This story is as good a Tikun as any for the anti-Jewish Friday protests. And you get Glenn Beck (sort of) without needing Glenn Beck TV. You know what was nice this week? Watching the international support Israel got from Greece, France and other countries against the Flotilla and Flytilla terror supporters. I would add, that it was nice that Israelis defended Israel's honor against these terror supporters that made it through into Ben-Gurion. I would add the word "allegedly", in that they allegedly beat up the terror supporters that got through. I was sitting in traffic today in Jerusalem. Traffic on the other side of the street had built up and there was no room to cut across Herzl anymore. Or let me rephrase that, there was room to cut across, but you couldn't go any further into the street on the other side, so the cars ended up blocking Herzl Blvd. And of course then comes the light rail. While the train had the green light (or the funny GO symbol, I didn't look at his particular traffic light), the train couldn't move forward because of the cars sitting perpendicular in his lane. It always amazes me how drivers need to cut across, just because the light is green (or was just green), without concern towards the gridlock they will be causing. Meanwhile, the train driver was trying to inch forward past his traffic light before it changed colors too, without hitting the car sitting directly ahead of him on the tracks. Needless to say, the lights changed. In the end it was a time-consuming mess that would probably never have happened if Israelis cared about gridlock in the first place. (On my way back, so guy stopped, parked his car halfway into the street and left his car to talk to his friends on the sidewalk, leaving a lane and half for 2 way traffic and absolutely no concern for the honking horns). 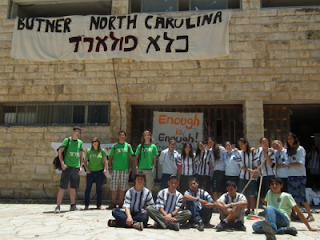 Everyone wants Gilad Shalit brought home. But there is a deep division in the country as to what price the country should pay (present and future) for this important objective. Those on the left say that “any price should be paid” to free him. And they believe that hundreds, even thousands of mass murderers and terrorists should be freed in exchange for Gilad Shalit (if he is even still alive), if that is what it takes. Those on the right believe that targeting Hamas leaders and collective punishment (shutting off water, electricity) against Gaza should be the first steps the government takes to free Gilad. As freeing hundreds and thousands of terrorists will invite more kidnappings of soldiers, and more terror attacks (as the precedents over the past 2 decades has proven). In the end, those on the left are “willing to pay any price”, except the price that those on the right want, and those on the right do not want to pay the price that those on the left want. Until Noam Shalit went into politics, the nation stood united behind him, and “any price” was something that was best left unspoken and purposefully vague, and whatever the price would be, it would be paid. Certainly in the media, Noam Shalit is off-limits to direct criticism. Almost no one is going to openly attack this bereaved father for what he says or for what he believes are the right steps to get back his son. But indirectly, the nation is starting to dislike (and even be disgusted by) the direction his campaign has been taken, as indirect criticisms, round-about discussions, and unfiltered talkbacks would indicate. Articles have begun to talk about the left-wing politicians that have hijacked the Free Shalit campaign, and they discuss the personal beefs these politicians have against Netanyahu. More and more people are asking why is the Free Gilad campaign targeting the Israeli government and specifically Netanyahu when it is Hamas that is holding Gilad hostage. And when the government takes actions against Hamas prisoners, and Noam Shalit then responds that the action is populist, or “too little, too late”, well the nation stands confused. And when Noam Shalit criticizes the right by saying that “the right really doesn’t want Gilad Shalit back”, people understand the place of pain where these statements are coming from, but the damage is still being done. Most media outlets are not saying outright saying that Noam Shalit is turning the nation against his campaign, whether out of his personal frustration, or because of the cynical political manipulation of left, but it’s easy to read between the lines to see that they are thinking it. But most won’t say it outright for all the right reasons. This development is unfortunate, because the nation is united in getting back Gilad Shalit, and the nation is aware that if Hamas ever agrees to ANY terms at all, in the end Israel will be releasing thousands of terrorists and mass murderers, and Israel will face a wave of terror and kidnappings as a result. Israel is aware of that and aware we will be paying that price. But Noam, whether out of cynical political manipulations, or personal frustrations is becoming a divisive figure with his statements, and that isn’t helping his campaign. On the other side of the spectrum is Jonathan Pollard. Pollard has become a uniting figure. Perhaps surprisingly. And the demands and protests for his release from captivity are uniting two camps that are almost never seen together: Meretz Youth and Bnei Akiva have joined forces to campaign together for his release. In their latest campaign (and a direct copycat of the actor’s campaign for Shalit), Meretz and Bnei Akiva are dressing up in prison clothing and sitting in a makeshift “jail”, as well as protesting in front of the US Consulate, and working to get signatures for a petition to free Jonathan Pollard. I don’t know if either will ever be released alive, I just know that everyone wants them both of them home safe.